Are you protected from harmful blue light? Science has proven exposure to high energy blue light (HEV) damages your eyes and can adversely affect your general health. Where does HEV come from? 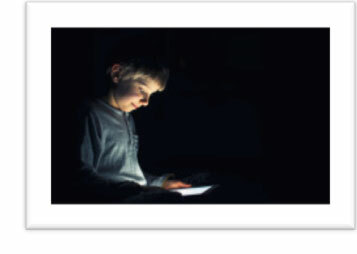 Research reveals that while adults are exposed to more blue light than ever before, children in particular are staring at excessive amounts of blue light for more than eight hours a day. With the dramatic increase in the use of electronic devices your eyes are exposed to far more blue light than ever before. This over exposure can disrupt your sleep tonight and damage your vision tomorrow. Difficulty falling and staying asleep. Some lens treatments reflect blue light. But, the best protection comes from lenses that absorb blue light. Ask your Parrelli Optical® vision correction expert to review the many options we offer you to keep blue light from damaging your vision and keeping you up at night. Protect your eyes and your children’s eyes from harmful High Energy Visible light.